Whopper's Bunker: "Fight with me!" 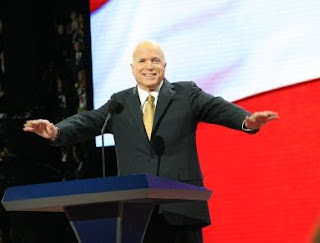 McCain inspires supporters. 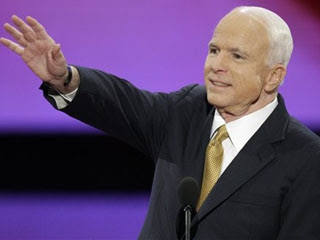 John McCain sounded a warning to Washington on Thursday evening that “change is coming,” in his speech accepting the Republican Presidential Nomination. His speech stressed his military service as well as his maverick reputation. 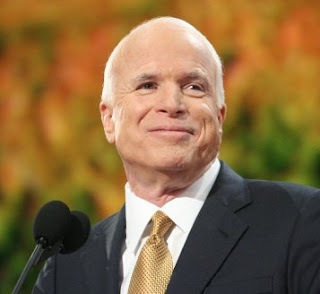 He called for an end to the “constant partisan rancour” he says has crippled the federal government and closed out the Republican National Convention by urging voters to “fight with me” and usher in a new age of American leadership. He did not attempt to match the stagecraft and magnitude of Obama’s historic acceptance address a week ago to a stadium of 85,000 people. He did, however, have the stage at the St. Paul Xcel Energy Center rebuilt with a plank that allowed him to step into the delegate audience to deliver his speech — keeping in line with his preferred “town hall” style of forum. Election Day is Nov. 4 but there'll be a lot of events before that. The next major one is the first presidential debate on September 26th.